A worthy addition to the Sandberg catalogue. Good price, great looks, flexible tones. It’s up against stiff competition at this price. Any bass equipped with a Darkglass Tone Capsule preamp is going to sound a little different, and even discounting its stunning visuals, this Grand Dark five, based on the California II TM5 model, has plenty going for it. Add new Sandberg Plus pickups, a 35” scale and the richest blue gloss known to man, and you’ve got something rather special. Thankfully, Sandberg hasn’t gone to town on the body and headstock design, so these aspects of the bass are familiar. A matching headstock is possible as a custom order, but our review model has the standard natural finish. A deep lower cutaway gives access up to the 22nd fret of the pau ferro fingerboard, while front and rear contours make it comfortable to play. The instrument is simply laid out; the control set - volume, balance, three-band EQ and coil selector - is easily accessible and intuitive. The clear Plexiglas custom scratchplate works well and the aged gun-metal hardware completes the aesthetic perfectly. Likewise, the bare front facing of the fingerboard offers a clean visual; white dot markers have been used on the side of the neck. A single 9-volt battery powers the Tone Capsule circuit and is easily accessible courtesy of a fliptop enclosure. With a 35” scale, the bass naturally feels a little longer than a standard-scale model, but the positioning of the bridge, the 19mm string spacing (which can be adjusted at the 3D Sandberg bridge), zero fret and fully Plek’d frets all contribute to the highly playable nature of this bass. With a rounded D neck profile and six-bolt attachment, the neck feels substantial; at 4.2 kilos (9.3 lb), the bass isn’t a featherweight, but it does feel solid. Navigating the fingerboard poses very few problems; there are no sharp fret ends, the action is well set and the finishing all round is excellent. The hardware is all sturdily fitted, while the machine heads operate smoothly and hold their tuning well. There is some headstock bias, as you’d expect from a 35” scale five-string. Thankfully, it sits perfectly on a strap. The tonal performance is impressive by any standard. Just sitting with the bass, you can feel the resonance of the ash, maple and pau ferro timbers. Vibrancy has not been forfeited here. The bolt-on neck helps to convey some characteristic spring to the overall tone, along with a piano-like sustain; hit any open string with a pick or your fingers, and smile as the note blooms and rings out. The string tension is very supple for a five-string instrument, so there should be very little playing fatigue while you navigate the neck. Plugging in, the tone has a tight, focused quality with considerable punch. The B string naturally benefits from the increased scale, with no evident ‘flappiness’. 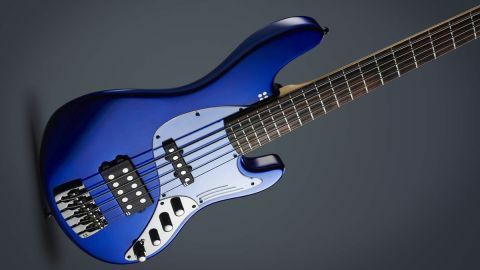 The fingerboard timber contributes to a snappier tone than we’ve heard on some rosewood-equipped instruments, but despite the electronic colouring of the signal, the bass retains a woody character. This is enhanced when switching to passive mode via the push/pull volume control. The bass is equipped with the new Sandberg Plus pickups, and the configuration of humbucker and single-coil works well; the humbucker can be switched to single-coil mode, providing a Jazz sound should you require it. The circuitry covers the full gamut of tones, and as is the Darkglass way, the mid-frequencies have been well selected, with controls for low and high-mid EQ. The treble response is less glassy; that’s not to say that slappers aren’t catered for, but plucked notes are less likely to shatter a mirror. The Grand Dark is an enticing prospect; the rolled fingerboard edges, adjustable string spacing and comfortable neck profile all contribute to making the player come back for more. It’s not out of the reach of many players in terms of price; it has a great selection of tones and a very classy look. This really is a fine bass.